It’s another July 4th in America. Why do we celebrate this day? I’d say because without this day America would be just another country. But what do others think about Independence day? More than ever, the meaning of July 4, 1776 is being deeply appreciated and cherished by those who understand the predicament that America is in right now due to loss of liberty and destruction of the Constitution. At the highest level of federal government power and at the globalist level, however, I’m imagining there is a quiet dislike for the celebration of Independence Day and what it stands for. Sure we’ll see celebrations across the country … but take a closer look. Sports leagues like Major League Baseball and many other organized entertainment events throughout the country will use this day to worship the military and their wars of aggression against other sovereign nations. They will twist the meaning of this day to feed their pro-war (war on terror) agenda and have millions of people honoring the military instead of honoring and celebrating freedom from tyranny. In the troubled times we live in, it is just as important to declare freedom from not only the British Monarchy but from the current new world order agenda, the United Nations and globalist schemes. Even in the best case scenario this current enemy of freedom (the globalists pushing for one world government) is as much a threat to freedom as the British Monarchy was. Given that the globalist new world order agenda is the greatest enemy of the Constitution, this day should also be a day when Americans remind themselves of just how evil the new world order agenda is and how important it is to be freed from it too. It is the antithesis of freedom and the fundamentals of the Constitution and Bill of Rights. The mission of the United Nations is directly opposed to the principles of the United States Constitution. The U.N. Charter suggests that the United Nations is a final authority tasked with caring for the world and all life on earth. It completely ignores the existence of any higher power, and it ignores the inalienable rights of the human being. Instead, it gives itself the obligation to protect humanity as if it, itself, is god. Seeing this contrast, on this Independence Day, is extremely important for anyone who cares about freedom and liberty. Independence Day is the best day to educate our youth about why it was so important for the founding fathers to get away from tyranny, and what tyranny and fascism is. No other holiday in America focuses on the importance of getting away from tyranny, yet we will hear nothing about this aspect in the mainstream media or out of the mouths of our politicians. So on this special day, let us truly celebrate freedom and remind others that without freedom we are all slaves. As Thomas Jefferson reminded us, without the federal government actually being afraid of the masses, there is tyranny. Let’s thus use this day to brainstorm for new ideas on how to get federal government to fear the people. I want federal government to be afraid of any website that posts this article, not the other way around. Let us not harbor any fear whatsoever of the federal government who now enjoys unconstitutional temporary powers not given to it by the Constitution but given to them by the likes of the NSA, the corporate media and the corrupt court system. Likewise, let us celebrate freedom from the new world order and all global bodies and criminals who attempt to subvert our basic rights, the Constitution and the principles of freedom. On this day, let us all push for a world where federal government has essentially no power except whatever we-the-people give it. Let us push for a world where every single piece of data collected by NSA is by default inadmissible in court and of no value whatsoever. Let’s push for a world where we finally starve out the NSA machine and force it to close its doors. Let us push for the establishment of a true international judicial body to protect humanity from those who have committed human rights violations world-wide. Let us push to fight back and restore our nation, our pride and our Constitution. 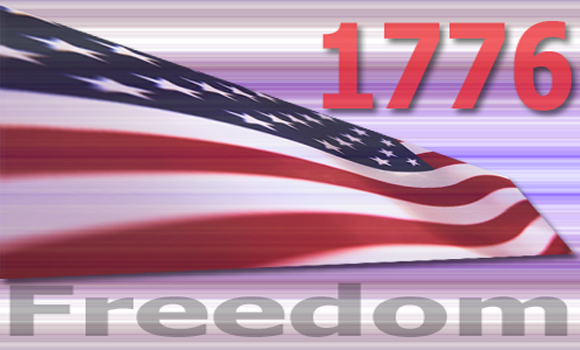 We must all come together in the spirit of 1776 all over again. This battle for freedom versus fascism is not and will not ever go away. Freedom itself is a flame that never goes out. This fight for freedom requires extremely brave men and women to be dedicated and focused on the task at hand. Things in America will get much worse before they get better, and the sooner we realize the importance and full meaning of Independence day, the sooner we’ll have a chance to turn this thing around. Declaring freedom from the British Monarchy without declaring freedom from the new world order is now an irrational thing to do since it makes no rational historical sense. Let us not be naive about our current situation. Independence from a controlling government is at the root of what America is all about, and the threat she is under at the hands of a more threatening (than the British Monarchy) new world order system, is as big a threat as she has ever faced. Humanity right now is in a desperate all-out effort to save itself from government, and we have to acknowledge this and act like we understand the consciousness of our times. One would not expect a normal society to both be under tyrannical oppression while at the same time celebrate freedom; but amazingly writer George Orwell did foresee this scenario which we can see in full effect today. Let’s set purpose to apply the meaning of Independence Day properly and in the proper time frame and context. We owe this level of integrity to ourselves and generations that follow. I assert this day that we need to secure full independence from the new world order and then look back at historic accomplishments as a secondary thing. We cannot solve the problems happening now if we are still dancing and celebrating battles of the past. Especially when the thing that we are celebrating is the very thing currently being taken away. Let’s instead remain extra vigilant and fly our freedom flags at half mast until we have reason to raise them all the way. That’s right, given the massive assault on freedom that we have seen in America, I say we should fly our flags at half mast. Then, and perhaps only then, will many begin to see the nature of this urgent situation.